First issue of the 2-issue The Children’s Crusade miniseries. Most people know Vertigo to be an imprint defined by creator owned works, often challenging many of the limitations that are put on mainstream books. Though it has always been a place for pushing the limits, it has not always had a library of relatively disconnected titles. In the beginning, the titles that were, at the time, pre-Vertigo, were actually a part of the DCU, though its own quiet part. Hellblazer, Sandman, Books of Magic, Swamp Thing, Doom Patrol, Animal Man, and others actually do interact with the DCU, including some cross over events. As we got later into the early 1990s, we had a universe for Vertigo that was largely its own. This meant that many of the titles had crossover characters, though they were not known to interact in the same way as the regular DCU. To its credit, Vertigo had one major crossover event, after which they never really replicated. 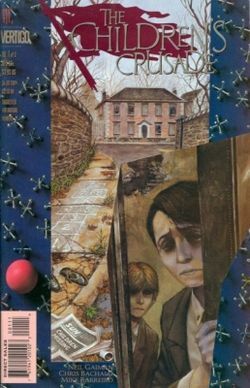 The Children’s Crusade is a seven-issue comic crossover on Vertigo from 1993 to 1994. The event itself is made mostly of “annuals” from regular series, which had been newly returned and allowed the creators to separate this event from the regular story arc that may be in the monthly issues. While these seven books make up the event, it would have been very advantageous to read several other titles in preparation for the event to get better aquainted with the universe. Swamp Thing #90-#136 (Again, only applicable for incredible depth for the Tefe character. It is good to note that the Children’s Crusade is actually a good launching point to start the regular ongoing Books of Magic series.